If your goal is to have a clean coffee maker, with vinegar you should be able to accomplish this fairly easily. Vinegar is an excellent solution for removing the stains, tastes and odors that coffee can leave behind. It is also natural and nontoxic, so you don't have to worry about it contaminating your coffee afterward. Fill a pitcher with a mixture of two parts water to one part vinegar. Stir the mixture with a plastic spoon to make it fairly uniform. Pour it into the coffee maker's reservoir up to the top fill line. Set your coffee maker to brew a full pot, as normal. Once the vinegar and water mixture has cycled through, turn off the machine and let it cool. Pour out the contents of the coffee pot. 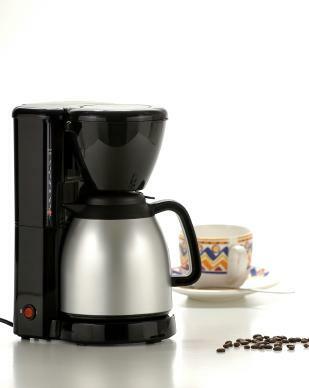 Run the coffee maker through a second cycle after filling it with water only to rinse out the vinegar residue. If you notice that your coffee maker still smells strongly of vinegar you can run water through it a second time. You do not have to wait for it to cool down beforehand. Once you've cleaned the insides of the coffee maker, it's time to clean the outside. Make sure it is cool and empty before you start so you don't risk spilling or injuring yourself. Spray one teaspoon of vinegar onto a cotton cloth. Wipe all of the outside surfaces of your coffee maker, replacing the cloth with a new one if it gets too dirty. Use a cotton swab dipped in vinegar to clean any areas that are hard to reach. You do not need to rinse, since you only used a small amount of vinegar. However, you can if you wish. Just lightly dampen a new cloth to do so. The last part of the coffee maker to clean is the pot and the compartment where the filters sit, if applicable. Both pieces should already be fairly clean from the process of cleaning the coffee reservoir, but you still need to wash the outsides and take care of any stains. If there are dark coffee stains remaining in the pot, fill it with vinegar and let it sit for three to four hours. Fill the sink with warm water and add two drops of dish soap. 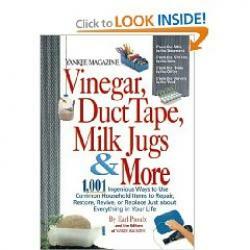 Wipe the inside and outside of the coffee pot and compartment with a sponge or steel wool pad. Drain the sink and rinse the items under the tap. Dry them with a dish towel or cloth. If you have hard water, you may want to rinse your pot with distilled water to prevent mineral deposits from leaving spots on the glass. The reason you can get a clean coffee maker with vinegar but you should still wash the pot with warm water is because you don't want your coffee to taste like vinegar. While rinsing should be enough for the water reservoir, many people tend to leave their coffee sitting in the pot for an hour or more, especially in a business environment. This can make the coffee take on the flavor of any residue that is in the pot, even if it is a minute amount. If you have a coffee mug or carafe that is stained, you can use the vinegar method on it as well. Just make sure to wash it with warm soapy water or put it in the dishwasher afterward.